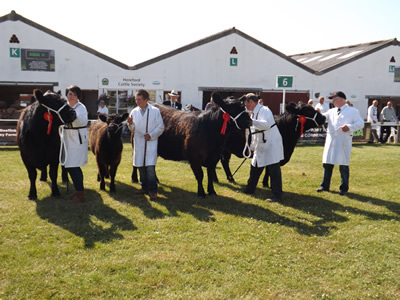 The Yorkshire sun shone on the Ross team from Shawhead, Dumfries, Jim, Selina, Carolyn, Haydon and Logan from Romesbeoch secured the overall, female champion, reserve champion, native junior championship and male champion at England’s Premier Agricultural Event. The female, overall champion and native junior champion was a 2011 born embr heifer Nerys 1307 of Romesbeoch she is by the herd’s senior stock bull, Kirkmabreck Nimrod which was purchased at Autumn 2008 Society sale and out of a Doon of Urr Nerys 42nd. 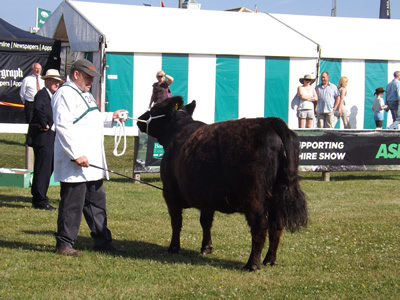 Nerys 42nd is a previous champion at the Society’s National show and won many local show, she has produced 5 stock bulls which are currently in pedigree herds. The reserve female and reserve overall was their senior heifer Beauty 1185 of Romesbeoch again by Nimrod, this March 2011 born heifer is out of Beauty C704 of Romesbeoch. 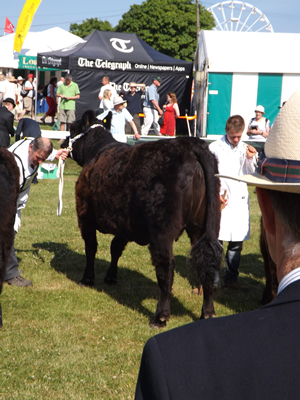 The male champion was the only male entry, Turbo Tam of Nether Cleugh was purchased by the Ross family at 2013 Spring Sale. His sire is Blackcraig Quest and he is out of Nerys Patricia of Nether Cleugh. 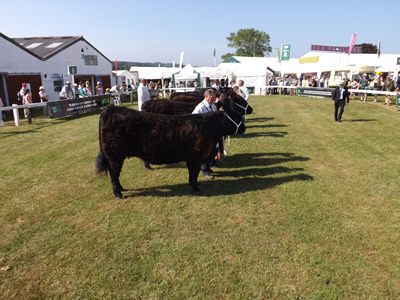 This was a record entry for Galloways at this prestigious event, with 13 Galloways and 5 exhibitors, three of them being new exhibitors at the show. The Society would like to thank everyone who exhibited and the Heath/ Gagg team for running the “office”, is was a very enjoyable few days, which was made even better when the sun shone. Heifer, born on or between 1st September 2010 and 31st August, 2011. 6th Mr S O Turner, Dalshangan Wood, Dalry, Castle Douglas – Lady Independence of Dalshangan Wood.